This year we will be continuing our series of lauded pairing dinners The Grand Wine Dinner at our exquisite The Grand Bistro to celebrate New Year’s Day 2017, the perfect start to your new year. Food and wine lovers are set to enjoy a six-course dinner with each course’s wine paired to perfection. Our restaurant’s acclaimed Chefs are set to stun our guests with ‘an evening of trios’ Norwegian Salmon, Guinea hen, Foié Gras, and many other delicacies – all done three ways. The evening begins with canapés and Pol Roger champagne from 6:30 PM. 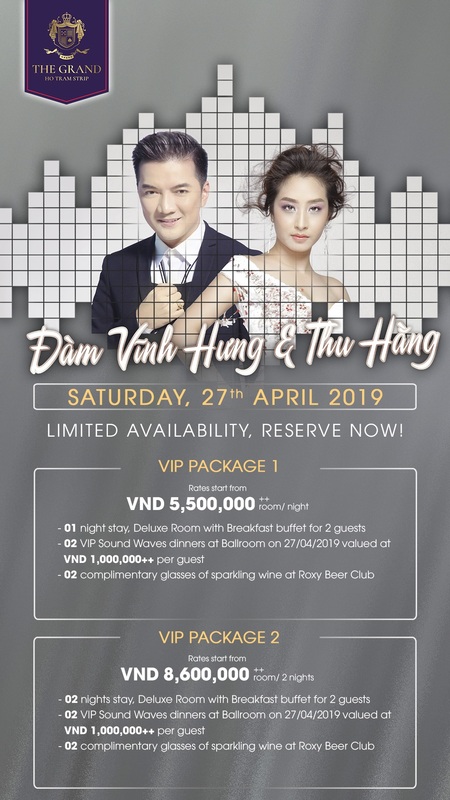 Book now with price 1,500,000 ++ VND per diner. Rooms are at The Grand Ocean View room (*) with countless entertainment facilities. Special 10% discount applies for groups of over four persons or packages.